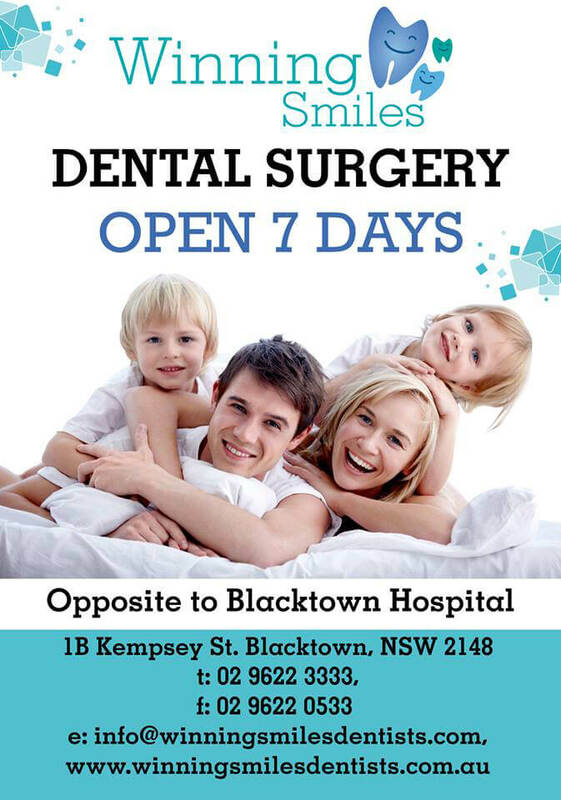 We are open 7 Days at Winning smiles dental surgery and committed to providing exceptional emergency dental care to the resident of Blacktown, Parramatta, Castle Hill, Kellyville, Penrith, Bella Vista and other areas of Sydney. We would like to specially notify that we also provide dentist service on Saturday and Sunday. We are the Dentist who open 7 Days to provide exceptional emergency dental care from Parramatta to Blacktown area residents. Our emergency dentist services are handled by skilled dentists who are experienced to deal with dental Emergencies such as toothache, chipped or broken teeth, denture repair, impacted wisdom teeth extraction, and more. Our emergency dentist in Blacktown, Toongabbie, Quakers Hill, Glenwood has attended patients from around Sydney and surrounding areas. Our emergency dentist can assess patients dental condition explains the extent of impairment /damage, conduct some diagnostic x-ray and commence appropriate treatment. Our emergency dentist provides treatment to stop further damage, and to provide immediate help to reduce your pain and distress. Our emergency dentists offer emergency services to a patient from suburbs namely Blacktown, Parramatta and around Sydney. Looking for a dentist open on Sunday? Here at winning smiles dentists, we understand that it’s not always easy to take out time for dental care during the busy weekdays. This is why we keep our weekends busy with appointments! On top of all our services, winning smiles dentists are well known as a “dentist open on Sunday” and “dentist in weekends”. We invite you to call us and schedule an appointment today! It is recommended to see a dentist in a certain emergency for instance tooth is knocked either it is completely Broken or started moving from its place, It is very important to see an emergency dentist soonest possible time. In many cases teeth can be completely restored to its original position if the action is taken immediately. We are throughout the year for an emergency including public holidays, weekend and after hours by appointment only. We provide a range of other services like Dental implants, braces care Pain Free Dentist and many other problems like dental injuries require emergency dental care to the resident of Blacktown, Parramatta, Toongabbie, Quakers Hill, Glenwood, Rooty hills, Marsden Park, Stanhope gardens, Baulkham Hills, Westmead, Windsor, Richmond and other areas of Sydney. At Winning smiles dental surgery, we are proud to say that we are the dentist open 7 Days and offers all General, Cosmetic and Emergency dental care services, we are available 7 days a week which means we are also available on Saturday and Sunday. At winning smiles Dental Surgery We always reward each Reference of new patients with exclusive $50 Off On Next Dental Treatment***(Conditions Apply).